Constricting Sliver ($0.10) Price History from major stores - M15 - MTGPrice.com Values for Ebay, Amazon and hobby stores! 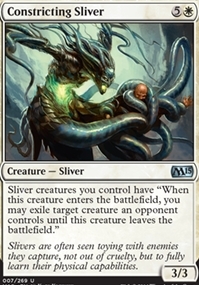 Card Text: Sliver creatures you control have "When this creature enters the battlefield, you may exile target creature an opponent controls until this creature leaves the battlefield." Flavor Text: Slivers are often seen toying with enemies they capture, not out of cruelty, but to fully learn their physical capabilities.